Shortsea Shipping is alive and well on America’s East Coast. 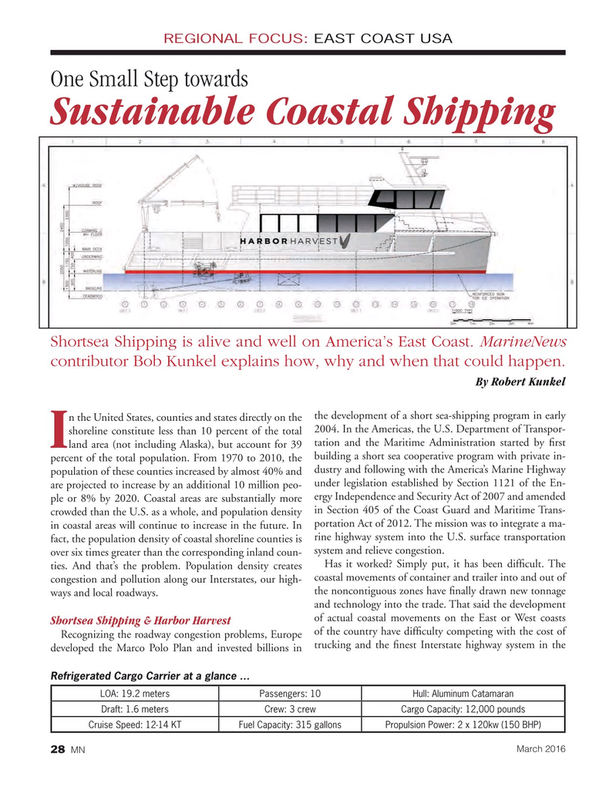 MarineNews contributor Bob Kunkel explains how, why and when that could happen. I percent of the total population. From 1970 to 2010, the building a short sea cooperative program with private in- population of these counties increased by almost 40% and dustry and following with the America’s Marine Highway under legislation established by Section 1121 of the En- are projected to increase by an additional 10 million peo- ple or 8% by 2020. Coastal areas are substantially more ergy Independence and Security Act of 2007 and amended crowded than the U.S. as a whole, and population density in Section 405 of the Coast Guard and Maritime Trans- in coastal areas will continue to increase in the future. In portation Act of 2012. The mission was to integrate a ma- fact, the population density of coastal shoreline counties is rine highway system into the U.S. surface transportation system and relieve congestion.